Potato Salad – this is the BEST potato salad recipe. It is the perfect side dish for all of your summer BBQ’s, picnics, and potlucks! 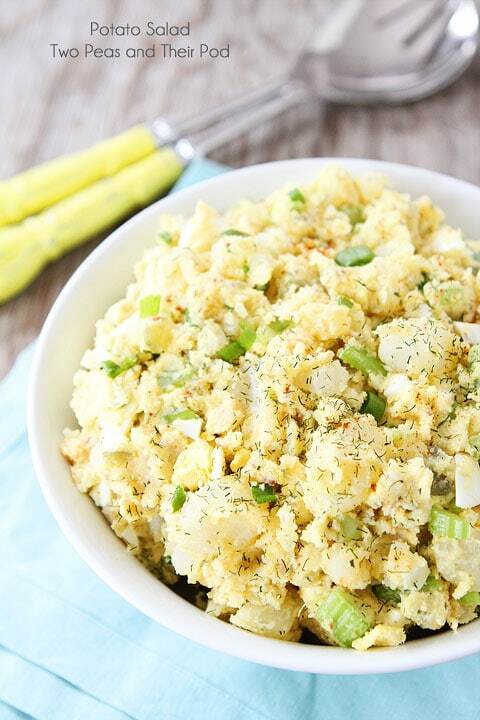 This classic potato salad is always a favorite! I never thought I would post a traditional Potato Salad recipe on our blog. I have always hated potato salad. I like potatoes and I like salad, but it is all of the other ingredients combined that have scared me. Well, a friend recently asked us to make potato salad for a gathering and Josh said yes. When he told me we had to find a good potato salad recipe, I looked at him like he was crazy. Potato salad? He said he would make it and I didn’t have to help, but I have a hard time staying out of the kitchen, so I put on my apron and we actually made the best potato salad! I was nervous when we first started, but as we got going, I was kind of liking this whole potato salad recipe challenge. And when we finished, I even took a bite and to my surprise, I actually liked it! Yes, I ate potato salad and liked it! This is huge for me so I am claiming this to be the BEST potato salad recipe. If I like it, you know it has to be good!